In the U.S., white blends have been the Rodney Dangerfield of wine. They aren’t considered elegant, like a White Burgundy, or bold and brassy, like a California Chardonnay. They don’t have the pedigree of a classic Alsatian or German Riesling, or the sassiness of a New Zealand Sauv Blanc. White blends aren’t any one thing at all. And that’s a problem in the U.S.: Americans want their wine, like their politics, to be cut and dried. They don’t want ambiguity or confusion — they want the label on their wine to say clearly and unequivocally, “Chardonnay,” or “Sauvignon Blanc,” or whatever. 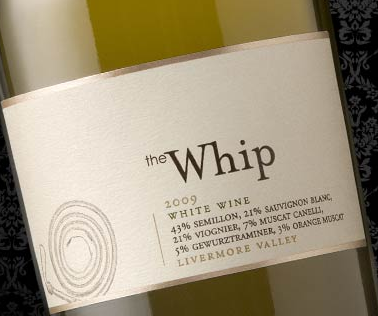 So I was intrigued when I found a white blend called “The Whip”. It’s not one thing, mind you, but the winery, Murrieta’s Well, had the good sense to list all six grapes right there on the front label. We like that in a wine! The six grapes blended to make The Whip 2010 include Sauvignon Blanc (31%), Viognier (27%), Semillon (15%), Pinot Blanc (11%), Orange Muscat (*%), and Muscat Canelli (8%). Right off the bat (or off the nose), I sensed richness and lushness. Rich aromatics suggested honeysuckle and orange blossom, which always says “Viognier” to me. I expected a similarly rich palate, and I got it. There was honey and exotic fruit that was just about to become cloying, when the acid kicked in and gave me a clean, dry finish. This blend was well designed. The aromatic grapes set the tone, but the Sauvignon Blanc and Pinot Blanc create balance and structure. Balance is definitely the key here: perceived sweetness up front, crisp dryness on the finish, and no harsh edges anywhere. For about $20 retail The Whip makes a nice wine for those who want a great “tween-er” white. I’d like to taste this with Seared Scallops or any kind of Pacific Rim dishes. Let me know what you think, and Cheers! Yesterday I made a confession: I like oaky Chardonnay. Not the “two by four in your mouth” kind of oaky, but I definitely like some richness and toast. I won’t take you through my diatribe again: you can read the story if you really want to hear it. Let me just cut to the chase and talk about one of the two great everyday Chardonnays I’ve enjoyed recently. Rodney Strong Vineyards has been a bastion of Sonoma County wine culture since it was established in 1959. Rodney was one of the first to believe in the potential of a Northern California wine region that was Not Napa. He explored the micro-climates of the Russian River Valley, Alexander Valley and what is known now as the Sonoma Coast, and identified the best vineyard sites for Cabernet Sauvignon, Merlot, Pinot Noir, Chardonnay and other classic varietals. He realized that Chardonnay would thrive in the cool-climate regions in western and southwestern Sonoma County, where the influence of the Pacific Ocean allowed the grapes to ripen slowly and develop great flavors and acid. Thirty years later, Tom Klein, fourth generation California agriculturalist, took the reins at Rodney Strong and continued the program of single vineyard, reserve and blended bottlings. Lots of California wineries have jumped on the Pinot Grigio bandwagon. Way too many, in fact. I have a problem with most West Coast Pinot Grigio, and my problem is that it tastes like anything but. It’s too fruity, too soft, too insipid. And the really cheap ones are too sweet. So it was a thrill to taste a California Pinot Grigio that tastes like… Pinot Grigio! The palate took me a few miles further. There was no rich fruit — no “fruitiness” at all! Crisp, mouth-watering acid led the way, followed by more minerals and slate. I was hard-pressed to find a fruit in here — lime, I guess (or maybe that “Kumquat” I see in wine reviews but never find in my grocery store’s produce aisle). The minerals and slate carryied through the crisp, clean finish. Oysters anyone? This wine was screaming for shellfish, and I wanted to be sitting in a French cafe or Italian bistro as I sipped my wine and downed my slippery, slimy oysters. The wine style that Tamas has captured is all about northern Italian whites like Gavi or Verdicchio, or even a French Sancerre or Muscadet. So how can anyone make this style in sunny California? Well, just look at the climate of the Central Coast: it’s not all palm trees and suntans. The region has a Mediterranean climate, with cool ocean breezes to moderate temperatures and very cool nights. This slows the ripening of the fruit, creating complex flavors and good acid. It makes for a damn fine Pinot Grigio, and at just $10 or so, Tamas Estates is also an affordable one. So put on your favorite beret, and drag out that red-checked table cloth. You’ll be speaking Italian in no time. Cheers!